The weekend of October 6th/7th 2007 provided a double-bill of treats for Prisoner fans. On the Saturday, the NFT2 played host to a sell-out crowd to watch "Many Happy Returns" and the new Network DVD documentary "Don't Knock Yourself Out" on the big screen, accompanied by members of the "Prisoner" production crew. 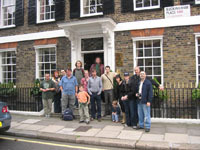 On the Sunday, the 2nd of this year's annual London Location Walkabouts took place. Well attended and successful as always, a review of the event can be read HERE.